In the second round of ABA League 2017-2018 season BC Red Star won 90 – 80 against BC Mega Bemax in Belgrade while BC Partizan lost 83 – 81 against Mornar in Bar. Red Star won a game in which both teams played well mostly because of the individual qualities of several players. The best of them all was Taylor Rochestie, who finished the game with 26 points and 6 assists. 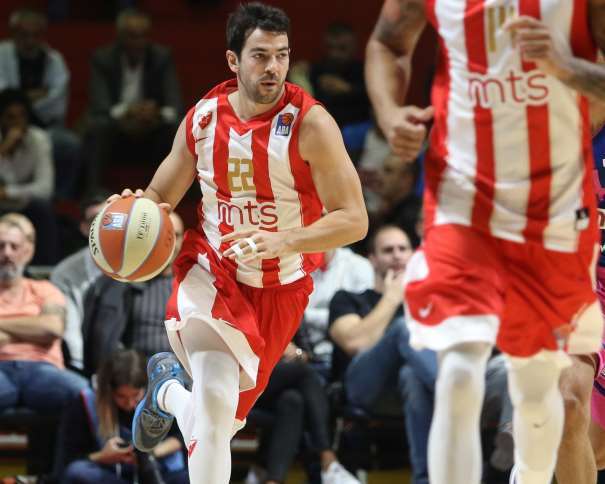 He was followed by James Feldeine, who added 21 points while Milko Bjelica and Pero Antić scored 10 points each. Game was controlled by red and whites but Mega Bemax will always returned in the game even though Red Star had double digits advantage. Three players had excellent roles in young team whose coach is Dejan Milojević: Dylan Ennis with 21 and Nikola Rebić and Goga Bitadze with 19 points each. Rebić was one of the key players in Megas’s attempt to approach and try to take advantage in third quarter, but home team would always have a response and not allowed any surprise. In this game, there were some attractive points and one of the most interesting was Mathias Lessort’s dunk in second quarter, move that is already put in competition for the best play of the season. Thing worth mentioning is that Pero Antić was greeted with ovations from fans and he was the best in key moments, because he was scoring in important moments in order to help Red Star to accomplish second victory in ABA League. While Red Star won, their neighbour Partizan NIS lost in Bar against Mornar and it was the second lost for Miroslav Nikolić’s team. It was an intense game, especially in the end, because in the last seconds Mornar scored victory thanks to the points of Brandis Raley-Ross. Before that winning score, guest’s player Marko Čakarević missed three points shot and allowed their opponent to win the game. Best scorer for winning team was Raley-Ross with 18 points. Good game had also Derek Needham with 15 and Uroš Luković with 13 points and 7 rebounds. For Partizan, best was Patrick Miller with 20 points, who took over leadership after Nigel Williams-Goss made mistake and because of it he was removed from the game. Vanja Marinković finished the match with 11 points and Marko Čakarević with 10. The first quarter was key quarter because host scored 36 points, and all because Partizan played miserable in defense. They didn’t have energy nor did players help each other while guarding opponents. Also, Mornar was shooting very well for three and Partizan wasn’t. The first three point shot was scored by Mihajlo Andrić in the end of the second quarter when hosts from Bar were already having double digits advantage. Black and whites made a lot of mistakes but in the end they had a chance to win the game or at least to try to win it in overtime, but Raley-Ross made buzzer beater shot and his team scored first victory in new ABA league season, while Partizan had another lost.